“Let me tell you about fear. It’s poison. It’s poison for your mind. It makes you lose control, it makes you freeze, it makes you take the wrong decision. When you let fear take over, you’re just an echo of your former self. An empty shadow and nothing more. But we’re all afraid, aren’t we? Even the brave are afraid. There’s no such thing as fearless. There’s always something to be afraid of. What will happen, what might happen, what we might lose, what we might never gain. 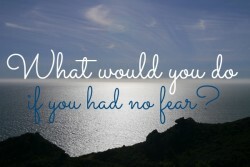 So… what is there to be had on the other side of fear? The awful truth about life is that what doesn’t kill often makes you wish it did. There’s great sadness and pain in this world, and we all get our fair share. But, you see, eventually all those things that don’t kill us either make us stronger or weaker. After a while, when pain becomes but a memory, we have a choice. We can either decide to become stronger or weaker. We can harden ourselves up or not. The choice is always ours. But we’re afraid… even when the pain goes away, we’re afraid it might return. Even after heartbreaks heal, we’re afraid someone else will break our hearts again. We might never want to fall in love again. We might want to spend a lifetime behind closed doors, just to be sure. That’s when we need to fight fear, we need to see what is it that we can find on the other side of fear. All our dreams and expectations. All our ambitions. All the power and the courage and the determination and the discipline we could ever need. All that lies just on the other side of fear. I’ve always wanted to go to the United States and forge a better future there. Ever since I was six, actually. I never even traveled there, mostly because I was afraid of the visa requirements. Or the fact that I’d fail. I just wanted to fight a sure battle, but no one could ever guarantee me that. No one ever will. And I’ve filled the ocean that lies between Romania and the US with excuses, endless scenarios, and fear. I’ve thought about it, over and over again, and decided that it would be best to wait. Living in a foreign country, all by myself, seemed like too much. Just the thought that I’d need to go through a lot of trouble just to arrive at my destination seemed impossible. I’ve never even been on a plane. There’s one thing about me that I never lost, one thing that I didn’t learn or mimic from others. I want things so badly that I’d be willing to do anything to get them. When I decide that it’s time to do so, I don’t let anything stand in my way. I did the same for writing. I wrote on and off for 8 years before finally deciding that I’d better man up and write more and more stuff. And finish stuff. And get stuff published. There are no impossible journeys in life. Only journeys we’re too afraid to even start. Now I know that life’s all about being afraid and doing it anyways. In fact, fear should motivate me. It should drive me to act, to try my best, to try to solve problems. I don’t want to spend a lifetime dreaming about an ideal future. I don’t want to wish for it to happen. I want to make it happen. Because no one else will do it for me. The world is never against you. The world does not hate you. You’re just alone. You and your dreams. And it’s entirely up to you to make them happen, one at a time, before it’s too late. via The other side of fear. This entry was posted in Worth Reading: Off the web and tagged Feelings, Personal Growth, Self Reflection, Wisdom. Bookmark the permalink.